Students read descriptions and match the appropriate monster based on each description. Students can create, describe and match their own monsters and those of their friends. From the blog La petite école. What web 2.0 tool could students use to create, describe and share their monsters? Try Drawzit, students draw, add text to describe and can then share it onto a blog, wiki, or email. Or, screen capture and save to desktop if you're just getting techie. 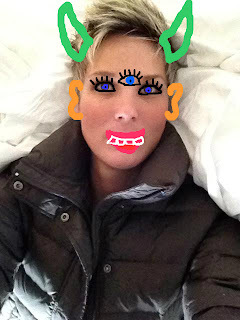 Here's my monster, doodle on an existing photo in Fotoflexor - wouldn't they love this? !